Description: From 6 to 20 inches tall. 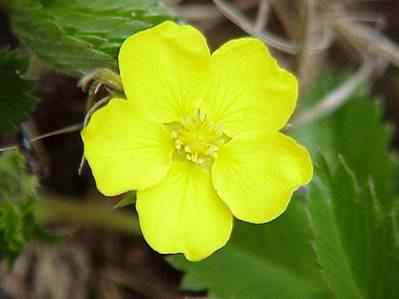 Cinquefoil suggest yellow flowered strawberries, but most species have radically 5 parted leaves (hence the name). This familiar species has prostrate stems, rooting at the nodes. 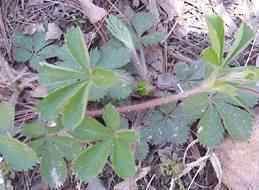 Flowers and leaves rise up from runners on separate stalks. Fruit is bright red , resembles a strawberry, but is taste less.